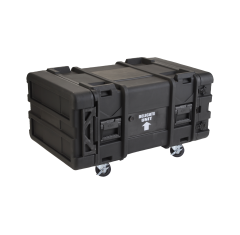 We have a collection of SKB 30” Deep Rack Cases that can contain and protect your sensitive and delicate items. Available in a range of sizes that each are capable of containing different numbers of units, our 30" deep rack cases use their gasket doors and rubber seal to remain waterproof and to keep your items dry. Our 30-inch rack cases each contain shock absorbers in every one of their eight corners as well as an aluminium inner. Our cases have removable wheels for easier transportation and are roto moulded for strength. These hard-wearing cases have pressure relief valves as well as recessed latches and front and rack rails. Each of the 30 Inch Rack Cases we have available at Absolute Casing is crushproof, shock resistant and corrosion proof. We know that these cases can surpass the standards you require for the protection and maintenance of your belongings.